We know you’re constantly looking for ways to get the most out of your beauty products. Today’s beauty lesson: How you can get different finishes from your liquid foundations by simply altering your application routine. Sounds silly? Absolutely not. Even if you only have one trusted liquid foundation, you can totally go from matte to dewy just by switching the tools that you use to put it on your skin. We all probably started with using our fingers to blend out our base. With clean hands, press—don’t drag!—the foundation onto your skin to create a smooth and natural-looking base. The warmth from your body will help the foundation melt beautifully onto your skin. Using a duo-fiber stippling brush, blend your foundation in circular motions—don’t forget to use a light hand to evenly distribute the product. If you have dry skin, you might want to skip this method because the circular motion from the brush causes micro-exfoliation, which can worsen your dry skin’s condition. Tip: A stippling brush is also a great way to blend out your favorite cream blush or highlighter! If you’re aiming for full coverage, buff on your foundation with a dense synthetic brush. This type of brush is often called kabuki. Blending the brush in circular motions onto your skin will lead to a seamless finish. Get a medium to large-sized flat foundation brush that will help you evenly apply your base. Some experts recommend that you apply your foundation using downward strokes—since our facial hair grows downwards—for a flawless finish. If you apply it upwards, you might end up accentuating your facial hair. Using a damp sponge is probably the easiest way to achieve a dewy finish with any foundation. Bounce the sponge against your skin to blend out your foundation evenly. You can also use this sponge to blend out your concealer and other cream products. 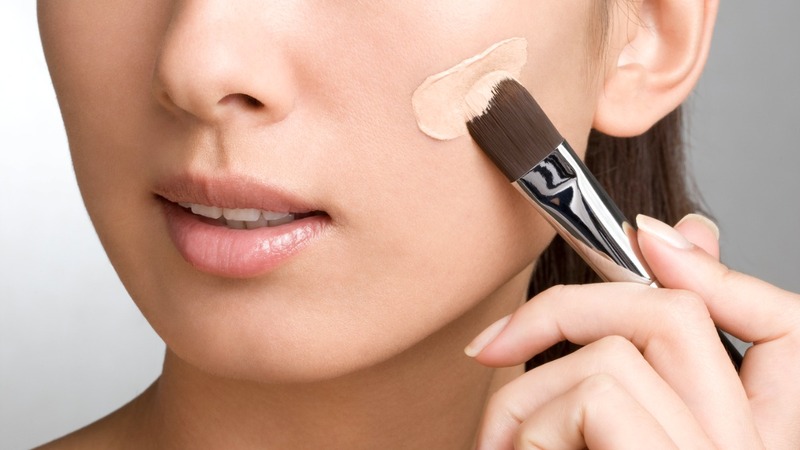 You don’t need several bottles of foundation to get the looks that you want for different occasions. Get the one that fits your needs perfectly and stick to it! We love the Revlon ColorStay Makeup, as it delivers flawless, all-day coverage even in humid weather. This drugstore gem—only P825 per bottle!—now comes with two upgrades: A pump for mess-free application and SPF to shield your skin from photodamage. It’s also oil-free, which means you won’t have to worry about it clogging your pores and breaking out your skin. Follow Revlon on their Facebook page.